Walking on 16th Street Mall, I see our destination. 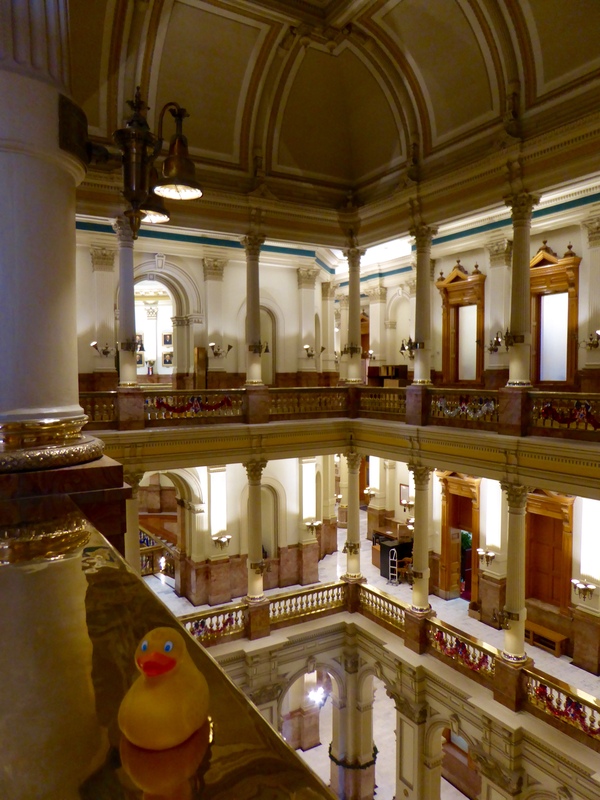 We are going into the state capitol building in Denver, Colorado. Mom says we will be on that observation area just below the dome. Outside? Way up there? We walk around to the east side and see this statue of an Indian and a buffalo. Buffalos used to roam through the American west. You can see that restoration of the capitol building is in progress. I see our outside observation ledge again, just below the dome. Back to the west entrance, there is a memorial for the American Civil War, complete with canons on each side. And more renovation work being done here. 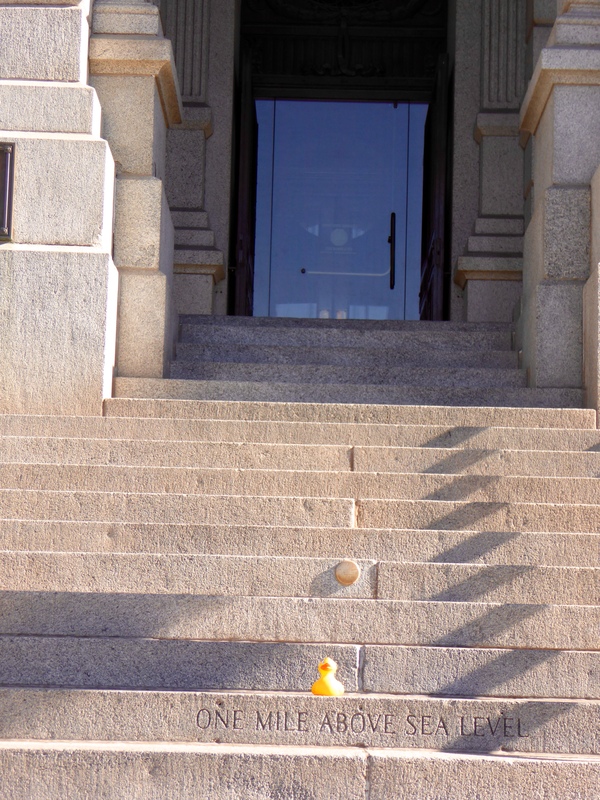 The stairs to the capitol building are a little different than most stairways. I am sitting on the step that was dedicated to being exactly One Mile Above Sea Level. It is even engraved on the step. But, recent findings say the step with the gold circular plaque may really be exactly one mile above sea level. That is one of the reasons that Denver is the Mile High City. 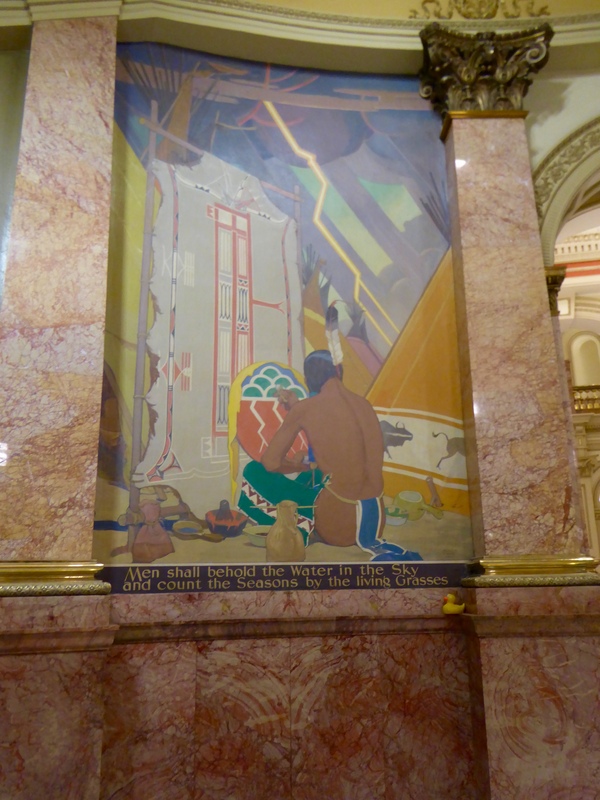 Inside the capitol building, in the rotunda, we find many paintings, emphasizing the importance of water to Colorado. We have much agriculture and many cattle ranches; yet Colorado is a semi arid climate. Water conservation is very important. Most of our water is from snowmelt in our Rocky Mountains. 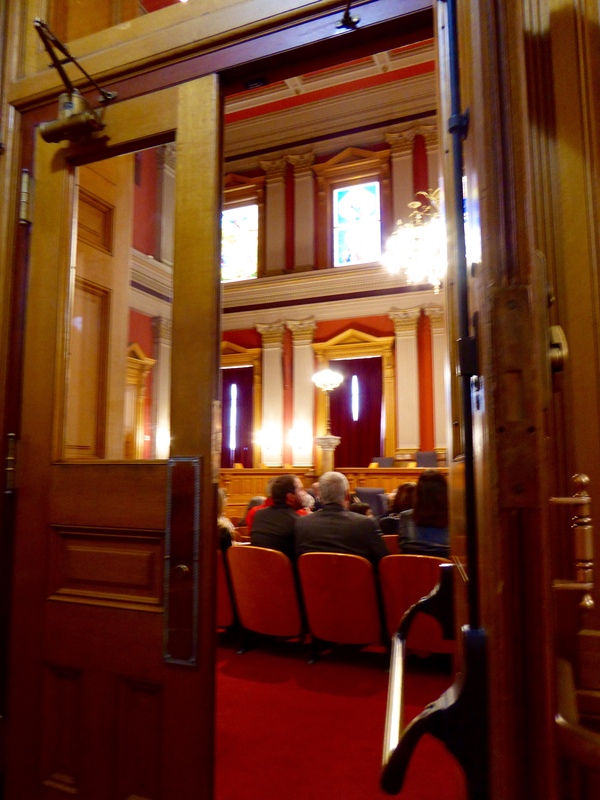 The Colorado legislature is not in session now. The desks in the Senate chambers are covered, waiting for the return of our state senators. Continuing through the capitol, we see a ceremony taking place here. This is a presentation ceremony awarding the French Legion of Honor Medal to two US Army veterans. During World War II, while stationed in France, Sergeant Dallas I. Godsey, US Army and Corporal David E. Lopez, US Army aided the French military. This ceremony, in Denver, Colorado, is for them to receive the French Legion of Honor Medal. This was a private ceremony for the veterans, so we did not go into the room. I, Zeb the Duck, was honored to be here to see these brave men. During our free tour, we walked up stairs to the third level. We think our capitol building is beautiful. 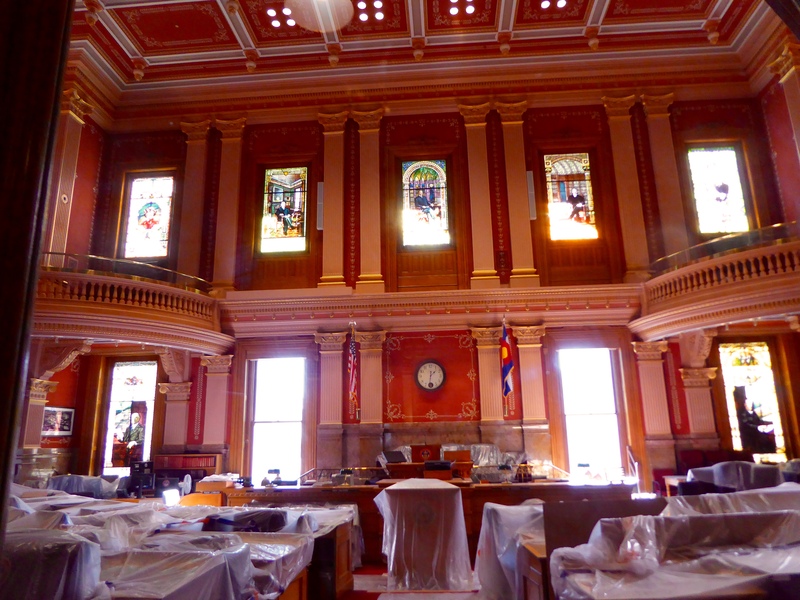 Many Colorado resources were used in the construction. The granite is from Gunnison, Colorado. The marble is from Marble, Colorado. The pink stone is rose onyx. This stone is rare and all known sources were used in the capitol’s construction. The rose onyx was quarried in Beulah, Colorado. The gold on the dome has been reapplied 4 times. 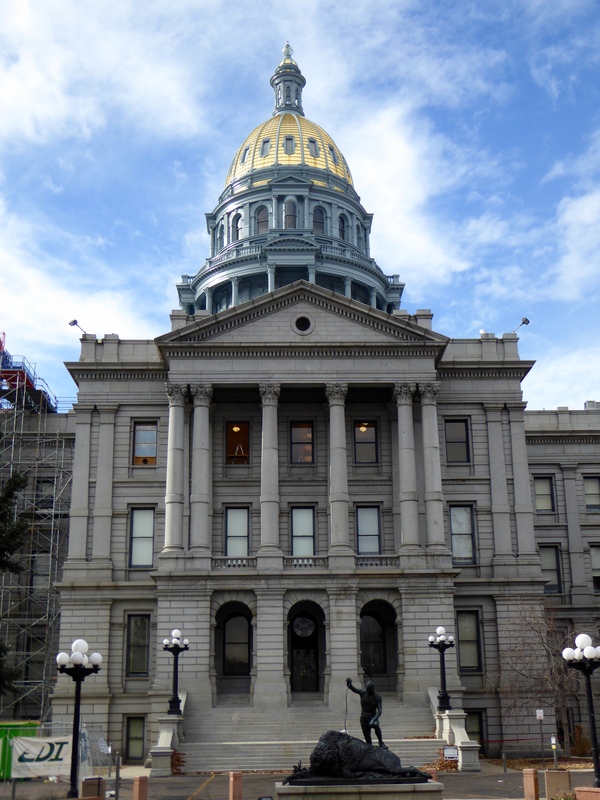 The latest was 65 ounces of .999 pure gold, mined in Colorado, hammered into gold leaf in Florence, Italy, and applied to the capitol’s dome in 2013. Humans can come this far without a tour, but we wanted more. We want to get closer to the dome. So, 99 more steps to climb. Our guide leads the way. Reaching the 99th step, we are now able to go outside. We are looking west toward Denver’s City and County Building. Civic Center Park is between the two government buildings. We see some more monuments. We will show you a couple of them when we are back on the ground. 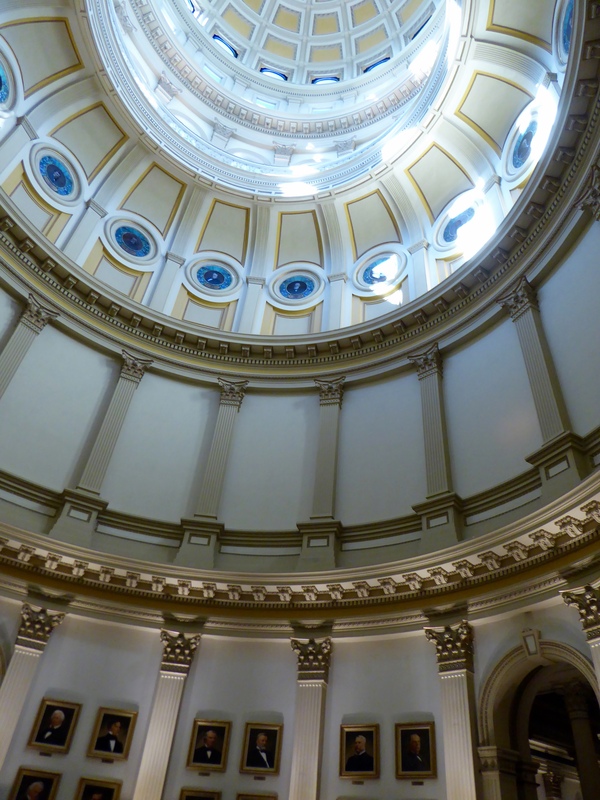 After walking completely around the capitol dome, we go back inside, down the same 99 steps and once again admire the interior of the capitol building. The stained glass window across from me honors Emily Griffith. Emily Griffith moved to Denver in 1894. She believed that everyone had the right to an education She founded The Emily Griffith Opportunity School, which helped make this possible for many people in Denver. 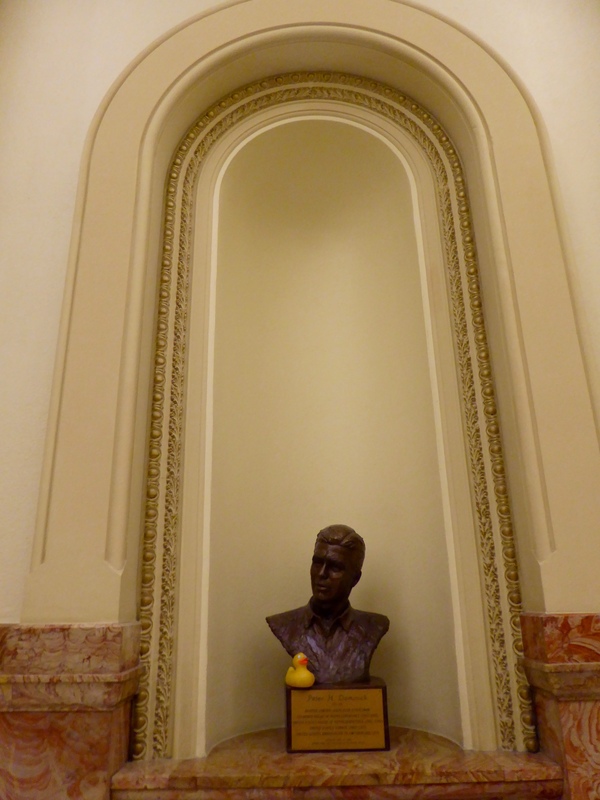 The Denver capitol also honors various Colorado people. This honors Peter H. Dominick, 1915-1981. Mr. Dominick was an aviator, lawyer, legislator, and statesman. He served in the Colorado House of Representatives 1957-1961. Then in the US House of Representatives 1961-1963. He was a US Senator 1963-1975. Mr. Dominick served as US Ambassador to Switzerland in 1975. 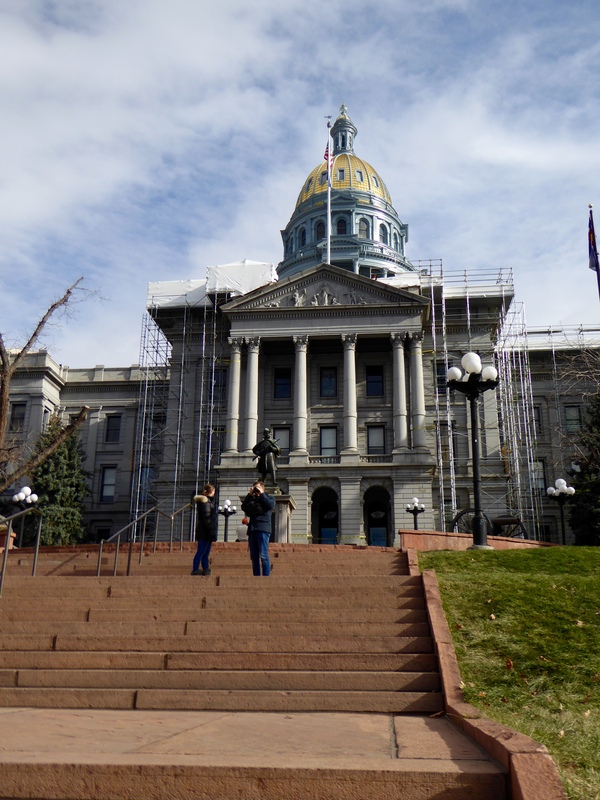 Leaving the capitol building, we went to Civic Center Park to show you two monuments. This one you saw from above and outside, while standing under the capitol dome, honors all US Veterans. This monument looks so much taller from the ground. 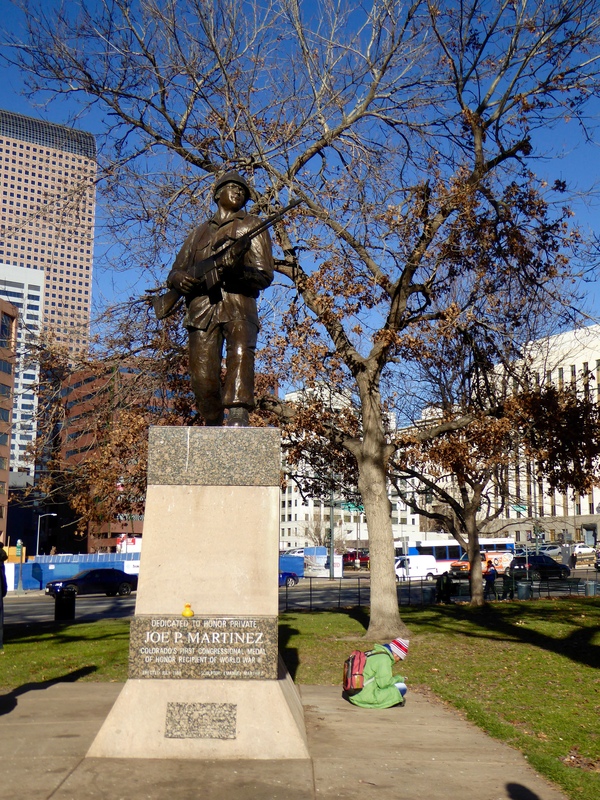 Here is a statue dedicated to Private Joe Martinez, Colorado’s first Congressional Medal of Honor recipient of World War II. 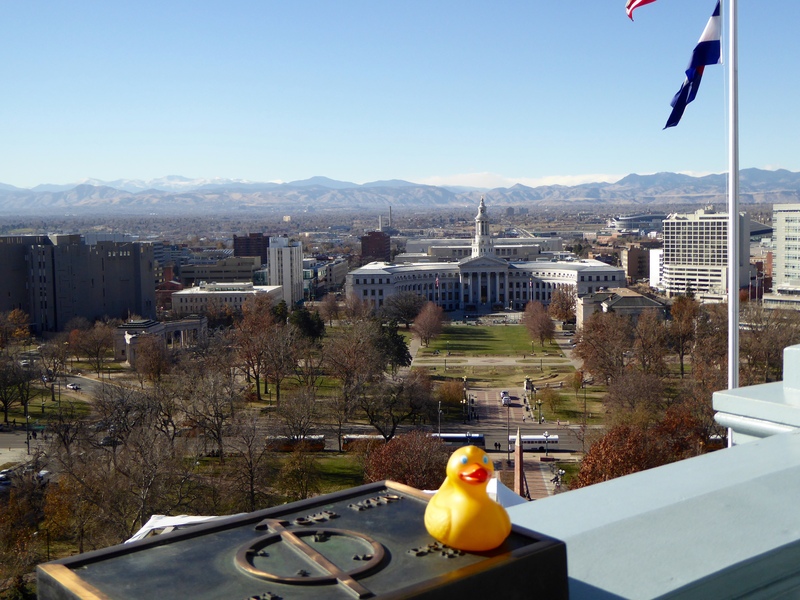 I, Zeb the Duck, love walking around downtown Denver. We just walked into the capitol and took a tour and then walked around Civic Center Park. 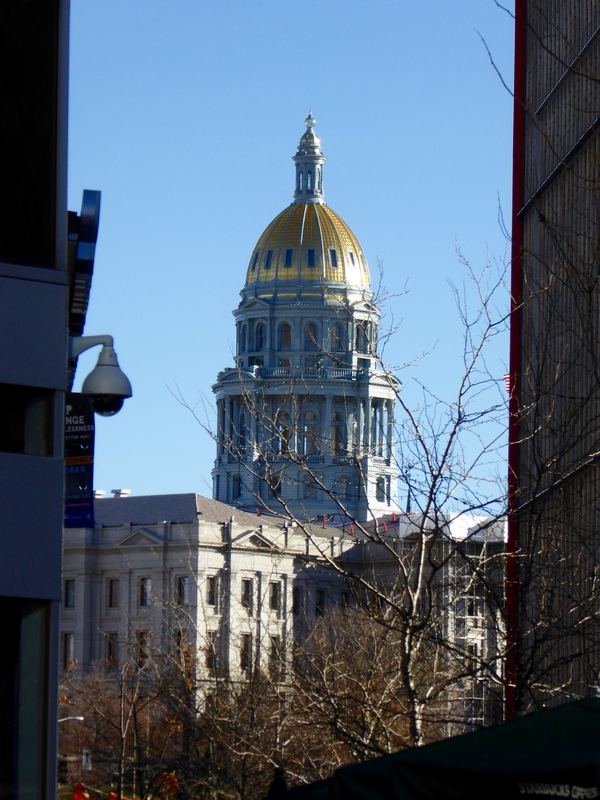 We hope you enjoy walking around Denver or any other city you visit. 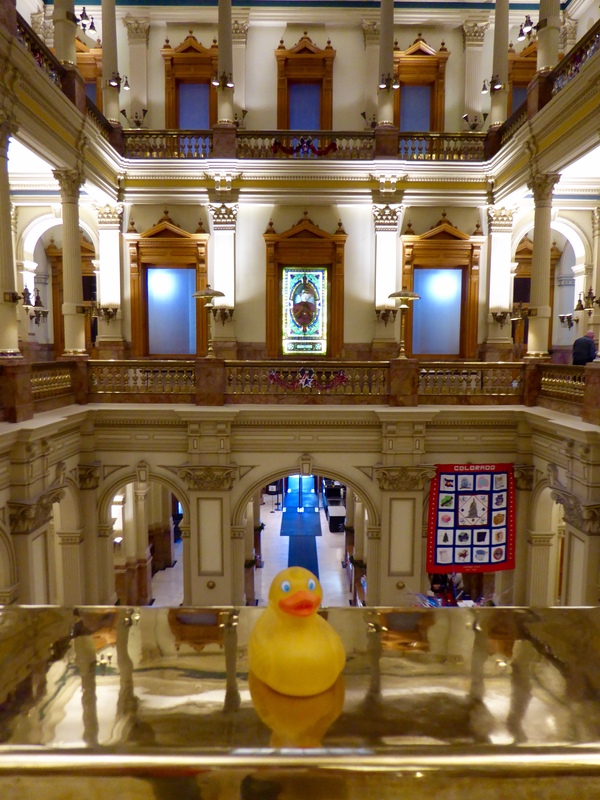 This entry was posted in Uncategorized and tagged Colorado, Colorado gold, Colorado granite, Colorado marble, Colorado rose onyx, Colorado Traveling Ducks, Corporal David E. Lopez, Denver, Emily Griffith, free tour, Peter Dominick, Private Joe Martinez, Sergeant Dallas I. Godsey, State Capitol Building. Bookmark the permalink. What a beautiful building. I like how the materials used are all local. I spotted that wall hanging behind you on the opposite wall. Is it a quilt? I believe so. The title is Colorado and each square depicts something important to Colorado. 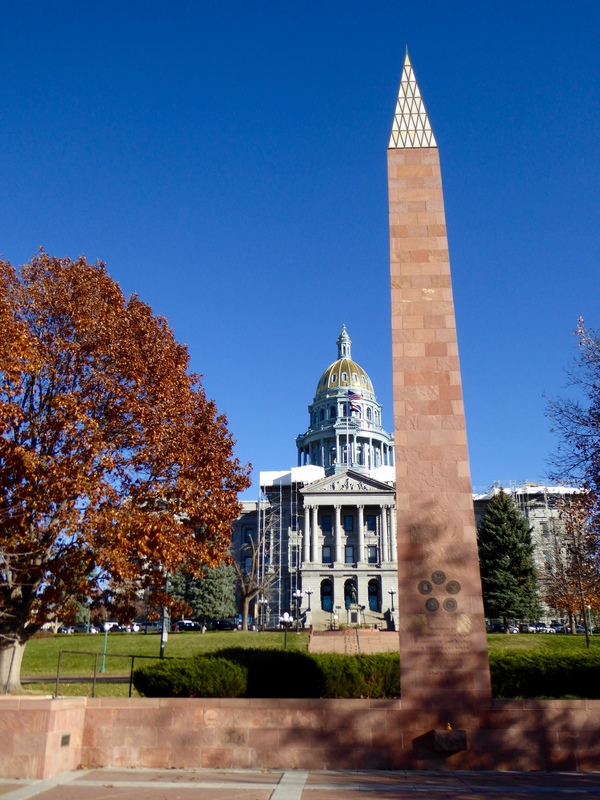 The first square contains the flag of the state of Colorado. It is a beautiful building, showing many of our state’s resources. Thanks for reading and commenting.